Peter caught the new build being published. But the version number wasn’t increased by mistake. The listed version is the RTW build (1.0.6567.0002). The actual published version is 1.0.6635.0069. The new version will be documented in kb2935541 but that KB is not yet live. As with the RTW build the MSI prohibits upgrade, therefore you have to uninstall the current version and install the new version and refresh the interfaces, as described in this post. After refreshing the interfaces (Open the AAD connector properties | OK | OK | OK) the new attributes must be configured for use. We’ll walk through this configuration in this post. 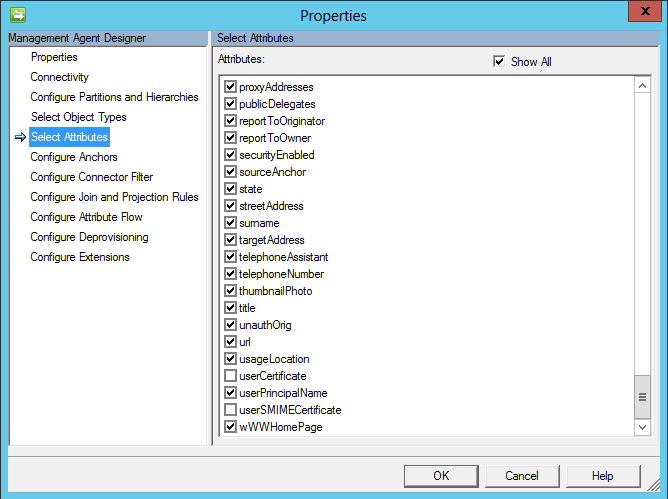 We need to add the new attributes to the metaverse before we can configure the import attribute flow (IAF) on your Active Directory Management Agent (ADMA) and export attribute flow (EAF) on your AAD connector. Open the FIM Synchronization Manager, click Metaverse Designer and add the following new attributes to your contact and user classes. I added the attributes to my user class and then added the existing attributes to my contact class. Here’s some instructions and screenshots. Scroll to the bottom and select userCertificate and userSMIMECertificate. Now that the schema is updated we can update the AAD connector and ADMAs. The configuration on the ADMA is pretty simple – direct IAF for userCertificate and userSMIMECertificate. To configure this, open the properties of the ADMA and click Select Attributes. Click Show All, scroll to the bottom of the list and select (check) userCertificate and userSMIMECertificate. Next click Configure Attribute Flow and create an IAF for each attribute for contact and user objects. Repeat the flows for the user object too. Once done all that’s left to do is configure the AAD EAFs. The AAD connector requires attribute select and EAF, which is very similar to the ADMA configuration, and some simple code changes. We’ll step through this here. Open the properties of the connector and click Select Attributes. At the bottom of the list the two new attributes are present and unselected. 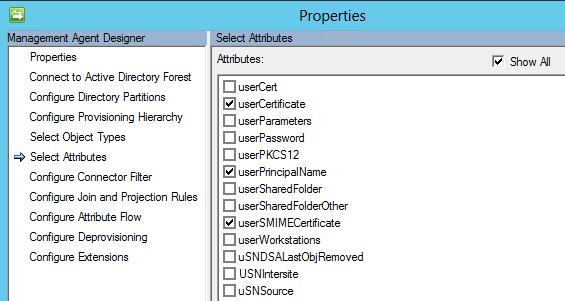 Select/check the userCertificate and userSMIMECertificate attributes and click Configure Attribute Flow. 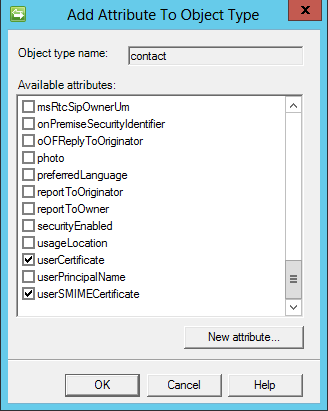 Click the contact object type flows and create new advanced EAF for userCertificate and userSMIMECertificate. Repeat for the user object type. The DirSync solution uses a rules extension based EAF to control the number of certificates that get exported to AAD. The DirSync code only exports the first 15 values of the multivalued BLOB. We’ll write our own code to do this too (and I’ve taken inspiration from the name of the DirSync rule to write this code so feel free to do something different). The following is example code, intended for the IMASynchronization::MapAttributesForExport method of your AAD rules extension. The new build will be documented in Microsoft knowledgebase article KB2935541, which isn’t published yet. Even if you’re not planning on utilising SMIME it is still worth keeping on top of updates and “upgrading” your connector. This entry was posted in Azure, Azure Active Directory, FIM, FIM 2010 R2, Office 365 and tagged AAD, AAD Connector, FIM, FIM 2010 R2, Forefront Identity Manager 2010 R2, O365, Office 365, WAAD Connector. Bookmark the permalink.